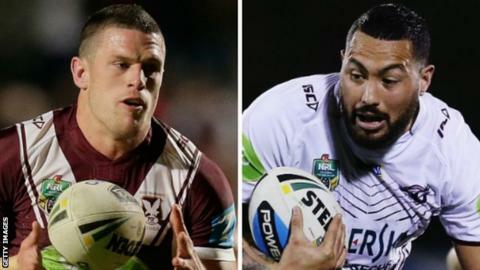 Super League side Salford Red Devils have signed Manly Sea Eagles pair Luke Burgess and Feleti Mateo on deals until the end of the season. Burgess, 29, is the brother of cross-code England international Sam and started his career at Leeds Rhinos. Tonga international Mateo, 32, has also played for New Zealand Warriors, Parramatta Eels and London Broncos. "We are bringing in a couple of great players as insurance," said director of rugby Tim Sheens. "You can't risk going into the Super 8s and picking up a couple of injuries and finding yourself relegated."